Semper K9 is proud to announce the acceptance of service dog in training Perkins into our Service Dogs for Veterans program. 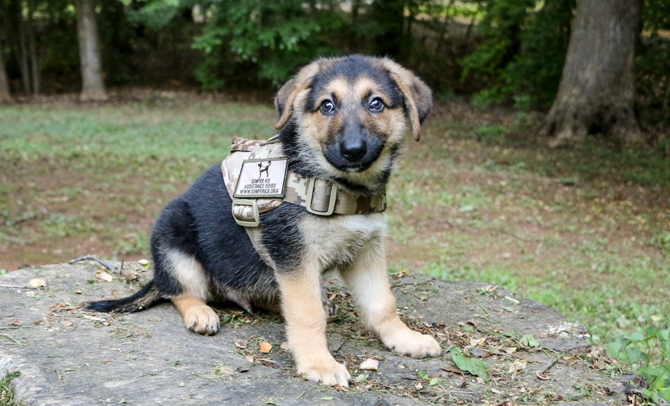 Perkins, an 8-week old shepherd lab mix, is named in memory of USMC Combat Photographer Corporal William T. Perkins Jr. and comes to us from our rescue partner Operation Paws for Homes. The Vietnam War was the nation’s first televised war. Within hours, combat footage of young Americans in uniform in the jungles of South Vietnam could be seen in living rooms across the country. Among those capturing the footage was Corporal William T. Perkins Jr., a 20-year-old Marine deployed to Vietnam as a combat photographer. Armed with a Bell and Howell 16mm motion picture camera and his personal 35mm still camera, Perkins documented the actions of his fellow Marines as they supported and defended the South Vietnamese people against the communist Viet Cong and North Vietnamese forces. For his heroism in protecting those Marines, Perkins became the only combat photographer ever honored as a recipient of the Medal of Honor. Corporal William T. Perkins Jr., filming U.S. Navy sailors aboard a Patrol Fast Craft, or “swift boat,” in the South China Sea, September 1967. Marilane Jacobson Collection, Division of Armed Forces History, National Museum of American History. Born on August 10, 1947, Perkins grew up hearing rich stories of his family’s military service in the Civil War and World War II. After Perkins expressed an interest in photography, his father bought him a Kodak camera that he used to learn about the hobby while a member of his high school photography club. After graduation, in 1965, Perkins enrolled at Los Angeles Pierce College to study photography. Restless and patriotic, the following year Perkins enlisted in the Marine Corps. Official portrait of Corporal William T. Perkins Jr., U.S. Marine Corps. Department of Defense Photograph (U.S. Marine Corps). Courtesy of Jacobson Collection. During boot camp, Perkins expressed a desire to be a Marine photographer. After receiving this assignment, to his chagrin, he found the work as a still photographer at Marine Corps Supply Center, Barstow, California, dull and unfulfilling. “All I do is take photos of the general in parades,” he told his family, as his father recalled years later. That fall, Perkins requested assignment to the U.S. Army Signal Center at Fort Monmouth, New Jersey, to receive training in motion picture photography. His headquarters agreed, but with a caveat: Perkins could attend the school, but his follow-on assignment would likely include service in the Republic of Vietnam. Undeterred, Perkins headed east and eagerly immersed himself in the art. “I can’t believe how lucky I am to be doing exactly what [I want] to be doing,” he wrote home to his family. A student in the motion picture photograph school, U.S. Army Signal Center and School, at Fort Monmouth, New Jersey, Perkins is seen here working with a Mitchell 35mm motion picture camera as he and fellow students practice making a reenlistment film. Courtesy of Jacobson Collection. On July 17, 1967, Perkins arrived in the Republic of Vietnam. The following day in Phu Bai, the Marines assigned Perkins as a photographer with Service Company, Headquarters Battalion, 3d Marine Division (Reinforced), and issued him a Bell and Howell 16mm Filmo motion picture camera and a .45 automatic pistol. The Bell and Howell proved Perkins’s primary weapon in the field, supplemented with his personal 35mm still camera. Almost weekly, Perkins mailed his family rolls of his film, taken throughout the Marine bases in the northern provinces of South Vietnam. Below are examples of photographs Perkins took during his travels in and around the northern provinces of the Republic of Vietnam in August and September 1967, paired with words he wrote home in letters to his family. Top: “Well, tomorrow I go out to an artillery installation and shoot some movies on that. After that I’ll go back to Phu Bai and turn in my film and probably come back to Camp Evans.”—William T. Perkins Jr., August 19, 1967. Bottom: “I’m going from Phu Bai to Dong Ha to pick up a camera and then come back. I’ve almost finished a roll of color slides which I will send home to be developed. I think the slides are of the people and the countryside. A few I shot from a helicopter.” —William T. Perkins Jr., August 23, 1967. Both images are from the Jacobson Collection. On October 11, Perkins joined the men of Charlie Company, First Battalion, First Marine Regiment, for Operation Medina. The operation intended to find, fix, and destroy enemy North Vietnamese Army (NVA) bases in the Hai Lang National Forest. The following day, NVA forces ambushed the Marines in a shower of grenades and bullets. As the ambush intensified, other Marines established a defensive perimeter where they cleared fields of fire and prepared a landing zone to fly out the 11 wounded and one killed and bring in reinforcements. Medevac helicopters arrived that afternoon and Perkins filmed the entire operation. Just as the last helicopter flew off from the clearing in the dusk’s fading light, all hell broke loose. Three NVA companies assaulted Charlie Company on two sides. Enemy blast and fragmentation grenades rained down upon the Marines from NVA soldiers who tied themselves high up in the trees on the perimeter edge. Green tracers of the enemy weapons slashed across the American lines as friendly red tracers answered back, the roar of battle punctuated by screams of the wounded. Enveloped by darkness, Perkins took up a position by a log on the edge of the landing zone perimeter together with Marine Corporal Fred Boxill and Lance Corporals Michael Cole and Dennis Antal. Perkins, second from left, is seen here filming a medevac (medical evacuation) on the afternoon of October 12, 1967, during Operation Medina. This photograph was taken about two hours before he was killed in battle. Photograph by Staff Sergeant Bruce Martin, Leatherneck magazine. Department of Defense Photograph (U.S. Marine Corps). Jacobson Collection. Enemy fire was relentless. Suddenly, an enemy grenade appeared in the air, silhouetted against the flash of another explosion. Antal saw the grenade falling, as did Perkins. Propping himself up on his arms, his Bell and Howell still strapped to his chest, Perkins cried out “incoming grenade” as the explosive landed behind the log, three feet from the huddled Marines. Perkins dove at the grenade, kicking Antal in the process, and tucked it securely beneath his chest. The grenade exploded, the blast lifting Antal in the air as shrapnel wounded both him and Boxill. As a fellow Marine treated the two wounded men, a navy corpsman arrived to check on Perkins. When Antal asked, “Is he all right?” the corpsman shook his head. As dawn broke on October 13, 1967, eight Marines—including Perkins—lay dead, 39 men were wounded, and 40 enemy lay dead scattered in and around the landing zone perimeter. in a valiant act of heroism, hurled himself upon the grenade absorbing the impact of the explosion with his own body, thereby saving the lives of his comrades at the cost of his own. Through his exceptional courage and inspiring valor in the face of certain death, Corporal Perkins reflected great credit upon himself and the Marine Corps and upheld the highest traditions of the United States Naval Service. He gallantly gave his life for his country. Medal of Honor citation for Corporal William T. Perkins Jr., U.S. Marine Corps. Courtesy of Jacobson Collection. Fifty years after his heroic deed, Perkins’s actions are not forgotten. Perkins’s films from his time in Vietnam remain preserved for viewing at the National Archives in College Park, Maryland. His footage captures the faces and actions of his fellow Marines, images preserved by a selfless young man whose love of country and photography made him a national hero. Corporal William T. Perkins Jr., U.S. Marine Corps, August 10, 1947—October 12, 1967. Courtesy of Jacobson Collection. Jessica Rambo, USMC Sgt (ret) and her service dog Bella. The name of William T. Perkins Jr. is inscribed on the Vietnam Veterans Memorial (“The Wall”) on Panel 27E Row 097. William T. Perkins Jr. is buried in San Fernando Mission Cemetery in San Fernando, California. Donate to support Perkins at http://donate.semperk9.org or learn how to sponsor his training here.